On its waytoward its next destination on Mars, NASA's Spirit rover took a glance back atthe tracks it has made on its journey, which exposed a bright patch of dirt. Spirit ison its way from a low plateau called "Home Plate," where it spent theMartian winter, to two features dubbed von Braun and Goddard. Spirit andits twin rover, Opportunity,have been roaming the Martian surface for morethan five years now, after touching down in January 2004. Opportunity isalso on its way to a new target, Endeavour Crater, miles (12 kilometers) away. On the1,861st sol, or Martian day, of Spirit'smission (March 28 here on Earth), the rover used its front hazard-avoidancecamera to look back at the tracks it had made that day. The rover'sright-front wheel, immobile since 2006, churned up a long stripe of bright soilduring this drive. Where Spirit has found such bright soil in the past,subsequent analysis of the composition found concentrations of sulfur or silicathat testified to past action of water at the site. Whenmembers of the rover team saw the large quantity of bright soil exposed by theSol 1861 drive, they quickly laid plans to investigate the composition withSpirit's alpha particle X-ray spectrometer. The Sol1861 drive took the rover past the northwest corner of Home Plate, makingprogress on a route around the western side of the plateau, which can be seenon the right side of the image taken by Spirit. 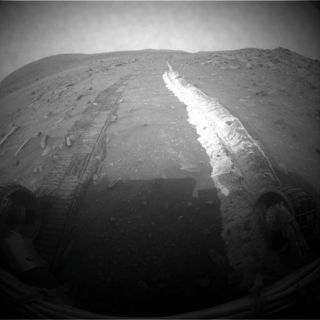 The rover covered about 74 feet(22.7 meters) of ground during this drive.